Join us on August 29th from 11:00 am until 2:00 pm outside the shop as we celebrate 10 years of Brady's! Pillers will be here to barbecue sausage on a bun and accept donations for Supportive Housing of Waterloo! We will also be having a silent auction with all proceeds going to this great charity! Don't forget to stop in for lots of great specials as we celebrate our 10th year in business! Read more about 10th Anniversary Barbecue! You've enjoyed our flattened chickens for the last 5 years — how about trying one of our new flattened Cornish hens! They are available plain or with Mediterranean seasoning. At approximately 1 pound per piece, they are great for 1– or 2–person meals! 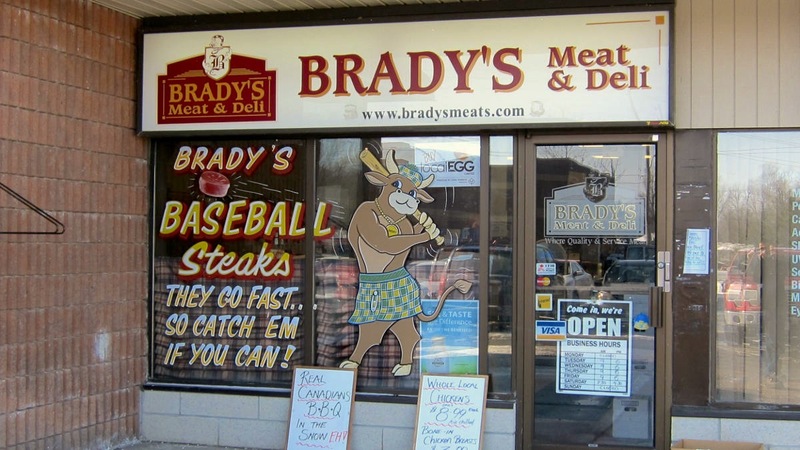 One of our city councilors, Karen Scian, has a really great blog entry about Brady's! In 2007, Rob was interviewed on Grand River Living, a local television show. They have now posted some of their episodes online, including Rob's! You can view the episode on Youtube. Team Brady's participated in the Manulife Bike and Hike in support of Saint Mary's General Hospital of Kitchener on Sunday, June 7, 2009. Thanks to all our customers who supported this worthy cause! We managed to raise $1415.00! Try our new Texas Chicken! It's a seasoned chicken breast wrapped around pork tenderloin. Brady's has started a team to participate in the Manulife Bike and Hike in support of Saint Mary's General Hospital of Kitchener! Please sponsor us! The event will take place on Sunday, June 7, 2009. Check out the latest edition of the Butcher's blog for more information about our delicious Wellesley lamb! Ever wish you could have our Thai-Rific chickens in snack form? Try our new Thai-Rific chicken wings!